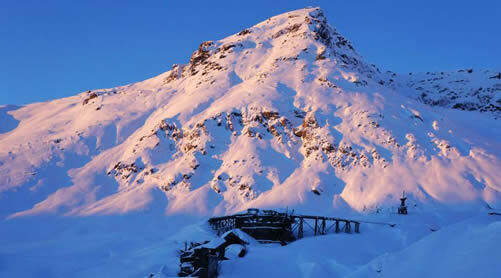 Government Peak Chalet is located in Hatcher Pass, approximately 40 miles north of Anchorage off of the Fishhook Road. The Chalet at Government Peak is a new rental facility in the Mat-Su Borough nestled at the base of Government Peak with a fantastic 180-degree view of mountains. Lifetime Adventures is the proud partner with the Mat-Su Borough in taking care of the day to day operations and rentals of The Chalet. 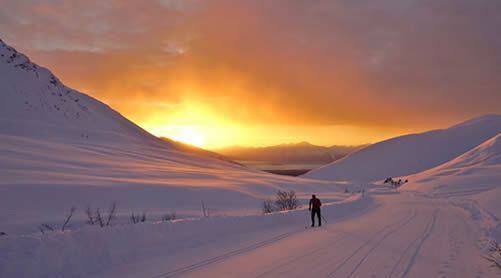 The Chalet at Government Peak is located within the Government Peak Recreational Area near Hatcher Pass. 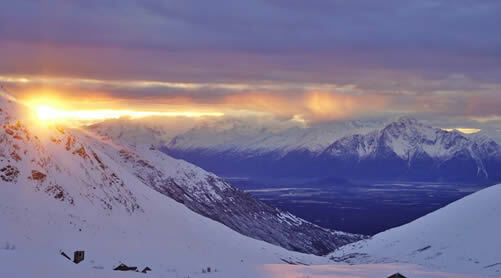 The Chalet features dramatic views of the Chugach Range, Pioneer Peak, and Knik Glacier, within the 1,300 sq. ft. Banquet room. The banquet has a 25-foot-high cathedral ceiling with two large windows with a 180-degree view. The Chalet has seating capacity for 151 guests with tables and chairs included. The facility has a variety of rental options and rentals can be customized to the needs of the user. Please inquire via email or phone for anything outside the hours/dates listed below. 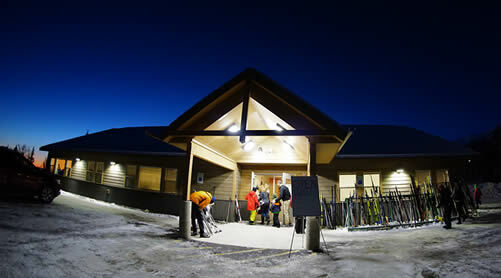 The Chalet will make every reasonable effort to help accommodate the needs of your event. Banquet room (51’ x 26.5’) ~1,300 sqft. 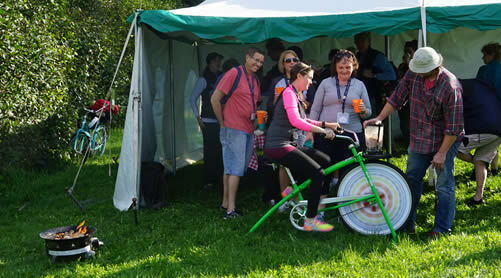 Pedal your way to a delicious smoothie or alcoholic beverage with our “smoothie” bike. Each smoothie can be made in under one minute and a whole blender can be blended in under five minutes! All rentals periods are 9:00 am (day of rental listed) to 10:00 pm unless other arrangements are made and approved. The Chalet requires a $100.00 non‐refundable booking fee to hold a date. No dates will be guaranteed until this agreement is executed and the fee has been paid. The booking fee will be added towards your rental amount. The security deposit is required 45 days’ before the reserved date of your event. The security deposit is for the general security of the rental agreement and applies to all damages which could be incurred by The Chalet at Government Peak as a result of the rental which includes but are not limited to damage to the facility, cleaning costs, fines, unpaid rental charges or other items. The Security Deposit is not part of the rental fee and is refundable. The balance of room rental fees shall be paid in full no later than forty-five (45) days before the scheduled event. The Chalet requires a minimum 30-day cancellation. 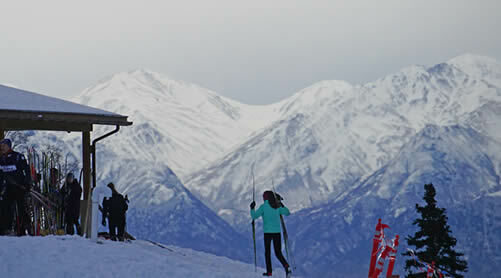 In the event of a cancellation, The Chalet will refund 80% of the rental amount. Payments can be made by check or credit card. Checks need to be written to Lifetime Adventures one check for deposits and another for rental amount. No fog/smoke machines are allowed inside the Chalet. Do not fasten push pins, nails, or tape to trim, walls, or ceiling. If you would like to decorate, please use potted plants, or you may tie ribbons. No staples, tacks, tape, glue, nails, or screws, please do not adhere items to the Chalet structure. Freestanding decorations are allowed. Late access to the rental space shall be at the discretion of The Chalet management. If the facility rental schedule allows the fee for late access will be $100 per hour with a 1-hour minimum. All parties will be concluded, decorations and debris removed and the premises cleaned by 10:00 pm. It is the sole responsibility of the Patron to conduct his/her function in an orderly manner concerning the facility. No illegal activities are allowed within the building, parking lot, and/or surrounding properties. Prohibited activities include, but are not limited to, underage drinking, illegal and/or prescription drugs, etc. If such behavior is noted, the event shall be closed immediately, and the Client forfeits their entire deposit, plus additional damages. The Chalet offers a number of other items for rent which are listed on The Chalet Rental Rate Sheet. Alcoholic beverages are allowed under the following circumstances and renters must fill out an ‘Alcohol Request Packet’. 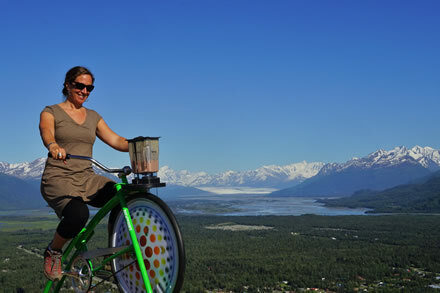 At all times the Client and its guests, vendors, agents, employees shall abide by all laws which govern the use, sale and consumption of alcoholic beverages in the Matanuska Susitna Borough. Private parties may serve alcohol, at no charge to their guests (if charging guests for their liquor, then the Client’s caterer or Client’s business must possess a valid liquor license, per the Alcohol Beverage Control rules and regulations), if the following items have been addressed and handled to the satisfaction of The Chalet at Government Peak. No service to guests under the age of 21 years – NO EXCEPTIONS! No service to guests who are intoxicated – NO EXCEPTIONS! A valid copy of a “Liquor Liability” policy must be on file with The Chalet at Government Peak. no less than 20 days prior to the start of the “Liquor Liability”. Liquor Liability policy must hold harmless The Mat-Su Borough 350 E Dahlia, Palmer, Alaska 99645, their officers, staff, and agents free of The coverage will need to be for $1,000,000.00 and will need to cover the venue for the day of your event. The Client specifically affirms that alcoholic beverages will not be sold to the guests. If guests are charged for alcohol, then the Client’s Caterer or Client’s business must possess a valid liquor license, per the Alcohol Beverage Control rules and regulations. The Client must show proof of insurance coverage which contains Liquor Liability. This coverage can be from the Client’s catering company or an individual policy whichever appropriately covers the use and distribution of the alcoholic beverage. Proof of insurance must be in the form of a current certificate of insurance which holds the Matanuska Susitna Borough and their officers, directors, staff, and agents additionally insured. The certificate must be on file with The Chalet before the start of the rental period. 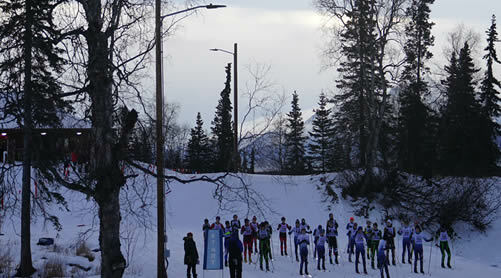 If additional insurance is deemed required for the event, it shall be the sole responsibility of the Patron to secure the insurance promptly and to hold the Matanuska Susitna Borough, and their officers, directors, staff, and agents harmless. The Chalet is a smoke-free facility. No smoking is permitted within the Chalet, meeting rooms, kitchen bathrooms, and/or front lobby. Smoking is allowed outside 50’ away from the building. A sand-filled container is available near the ski shed. Please refrain from littering the area with discarded smoking materials (i.e., cigarette butts, cigar butts, matchbooks, etc.) The Patron will be charged a penalty fee of $1,000.00 if there is any smoking inside the building. Disposal of cigarette butts anywhere inside the bathrooms will be considered smoking in the building. The facility will be presented to the Client in a clean and orderly fashion. All surfaces will be wiped or mopped, all trash containers will be empty, the carpets will be vacuumed, and tables and chairs will be orderly stacked. The Client is responsible for returning the facility in the same clean and orderly fashion. Upon vacating the facility, the Client is responsible for all costs and damages necessary to return the facility to its original condition. The Chalet offers cleaning services on an hourly fee basis. If those services are desired, they can be added to the rental contract on the “The Chalet Rental Rate Sheet” The premises will be inspected either immediately after or the next morning to ensure the facility is left in the identical condition as when it was received. 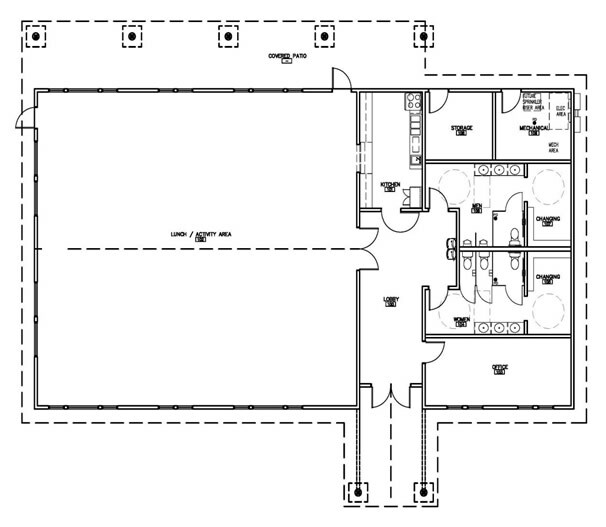 The inspection will include the bathrooms, kitchen, front entry, the banquet room, and the parking area. The inspection will ascertain that the bathrooms have been cleaned, the floors have been mopped, the carpet has been vacuumed, the windows and walls are clean, the trash has been emptied, bagged and placed in the facility dumpster, and there is no damage to the premises. Any damages including additional cleaning, repair or work as a result of the inspection will be performed by The Chalet and deducted from the Security Deposit. Damages are not limited to the balance of the security deposit. If these damages exceed the security deposit, the Client will be responsible for all additional costs and will be invoiced. Upon conclusion of the inspection, the security deposit and any refund will be mailed to the Client within seven days, should no additional funds need to be deducted.